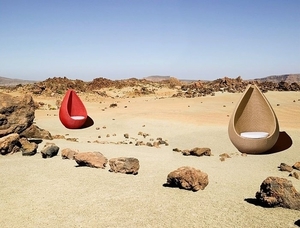 A design armchair is characterized by innovative or unusual construction, shape, colors or materials. Its function may not be recognizable. For example, it could be an amorphous piece in synthetic rattan with brightly colored removable cushions. Such chairs may have multiple, innovative features, including built-in shelving or lighting. It may even encourage users to sit in unconventional positions. Unusual structural materials include cast bronze and thermoplastic. Innovative materials such as recycled yarn and cardboard are sometimes used for the upholstery. Determine whether chair style will complement or contrast with its environment. If it has an unusual shape, ensure that there is adequate room around it to avoid the space looking cramped and to allow for easy movement. Consider whether the chair will serve a particular purpose or if it is primarily decorative. Other factors include comfort, appearance, durability, ease of maintenance, weather and stain resistance, and mobility.